Ergotron 24481003 LearnFit Aluminum Adjustable Stand Up Desk with White Top - 24" x 22"
Height can be adjusted from 33 1/4" to 49 1/4"
The Ergotron LearnFit SE Sit-Stand Desk comes with many features to promote productivity in the classroom or office. For more information, check out the video. "These new desks came in and we were like 'whoa!' because we could raise them and lift them. That's, that's what I like mainly about it, just because you can adjust the height that's comfortable for you." "Just getting to your desk and adjusting it and then just standing there and doing your work." "The desks allow us to make transitions much faster, much easier, much cleaner with fewer distractions, and it gives me actual more time, more classroom time, to carry out whatever lesson, or activity, or discussion is being done in that class." "And the idea is not to sit all day, and the idea is not the stand all day. The idea to find that happy medium for the students to listen to their bodies." "I get tired and a little drowsy when I'm sitting, but standing up keeps me energized and awake." "When I'm sitting, it's kind of easier for me to just doze off, but when I'm standing it keeps my energy up." "The desks have it where you could like, lean on the desk and actually if you're tired just raise it up or down depending on what mood you have, or if you want to just raise one leg and stand on it, just to help you with your posture, then you could do that." "When I first saw them I was super juiced, when I first saw them come out of the box, I was like 'yes!' Like this is awesome right? Because think that it has the potential of really providing to young people, and if it's not even a whole class, but if it's students who need." "Classrooms now need some furniture that can keep the pace with the hardware and the software collaboration that's trying to be provided." 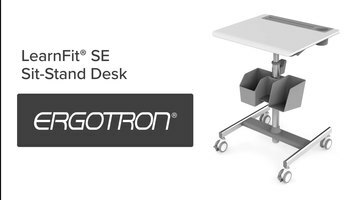 The Ergotron LearnFIT: Get Students Standing desk offers students a happy medium between sitting and standing all day, enhancing focus and creating a positive classroom environment. For more information, check out the video. 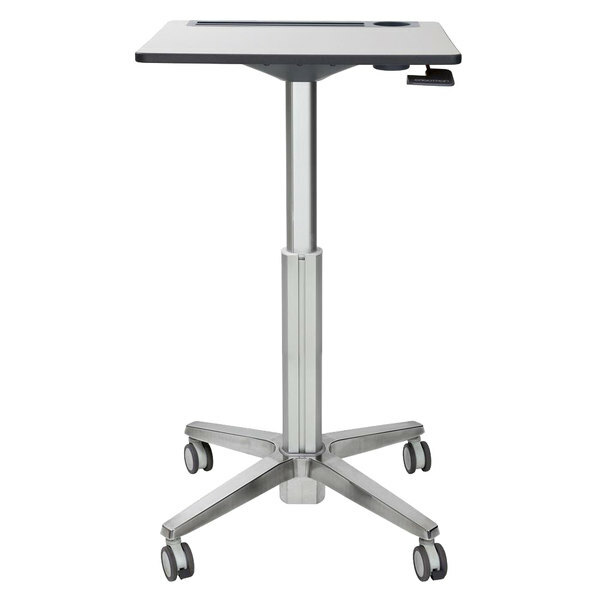 Transform your classroom or conference room into an active learning environment with the Ergotron 24481003 LearnFit aluminum adjustable stand up desk with white top. Standing desks promote better health and longer engagement from those using them. 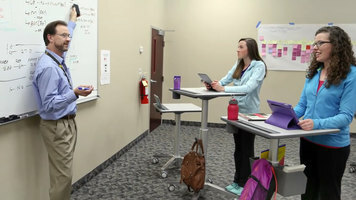 Each participant can easily transition from sitting to standing and personalize the desk to his or her preferred height without disrupting the rest of the room. 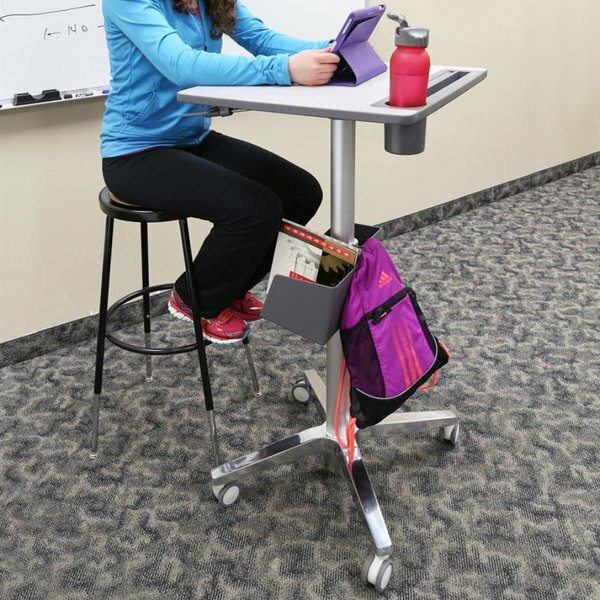 Better yet, these mobile desk can be quickly and easily moved into different formations to suit an agenda, lesson plan, or specific learning needs. 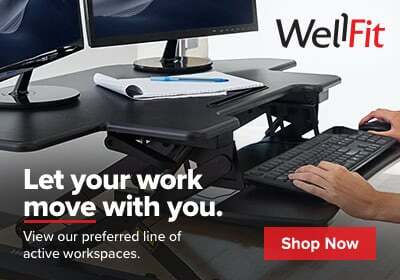 The Ergotron LearnFit adjustable stand up desk features four dual-wheel casters (two locking) for easy maneuverability. With adjustable height from 33 1/4" to 49 1/4" tall, this desk can accommodate young students to adults. This sturdy and stable desk also includes user-friendly features like a hook to hang your backpack or purse, a cup holder, and a tablet slot and pencil tray integrated into work surface. Height: adjustable from 33 1/4" to 49 1/4"